Like sorting laundry, I separated the fabric into darks and lights for this design. I am hopeful that with the simple distinction of dark and light, the overall symmetrical design will be evident. We will not be able to judge the success of this idea until it comes off the loom. 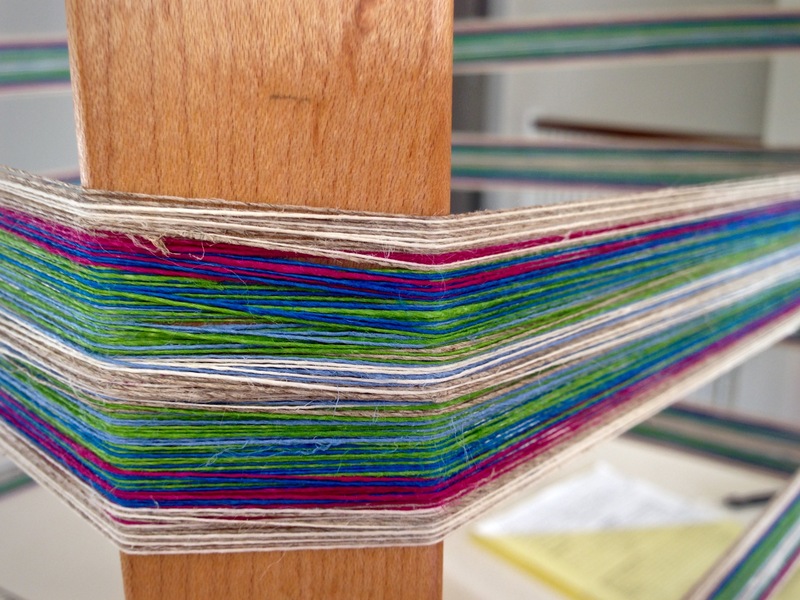 Cloth tape has units of inches marked on it for measuring the rug on the loom. Tape is moved and pinned for each woven section of the design. Sometimes I question the plan, even though it is drawn out on graph paper. I wonder how the finished rug will look. But then I remind myself that I see the cloth from the breast beam to the fell line, which is a very small segment of the whole design. I have to trust that the graphed design is the way to go, and I make up my mind to stick with it. God loves all of us. It takes courage to love Him back. We love God by walking in His ways. That is not always easy. It means learning His plan with a humble heart, and making adjustments to our thoughts and actions. It is also recognizing that we see a very small segment of the overall picture. To go my own way instead would be short-sighted. The designer knew what He was doing in the beginning. Surely, He will carry His good plan through to the end. May your designs come to life. Linen lace weaving. It’s like weaving air. 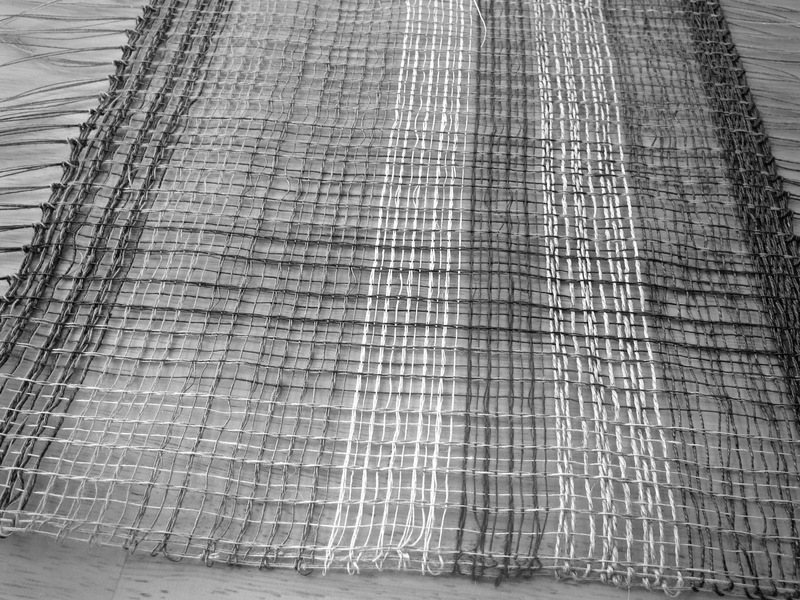 16/1 linen warp and weft, with uneven sleying and careful weaving. 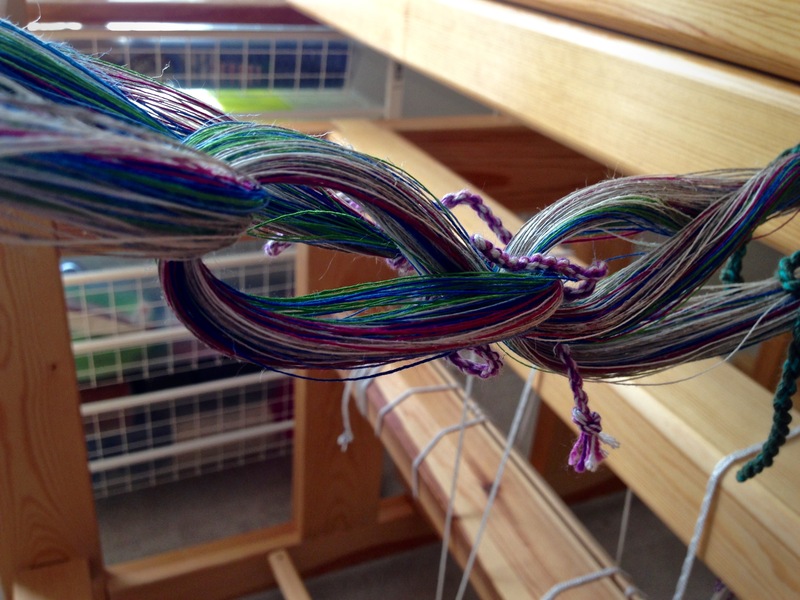 “Beating“ is not the right word this time; let’s call it “placing the weft.” Gentle, gentle, gentle, easy does it. No temple needed. Indeed, what would you hook the temple into? There is almost nothing there. Winding the 16/1 linen warp on the warping reel. 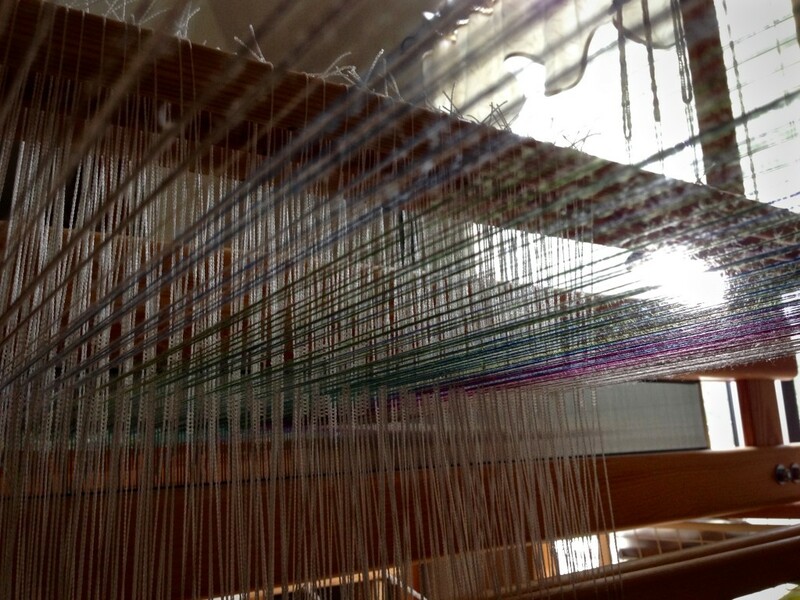 Wound warp is chained and placed over the breast beam and through the beater in preparation for dressing the loom. 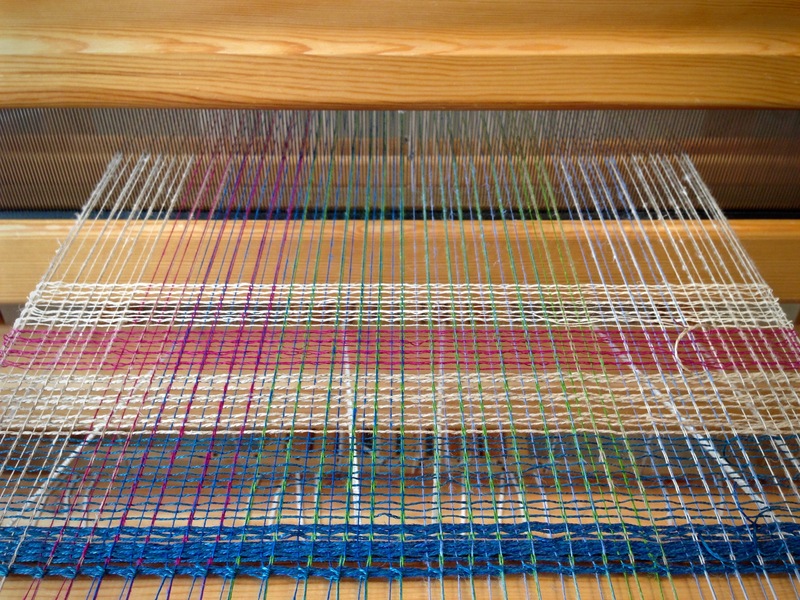 Ends are counted and grouped before threading. I did weave a sample, trying out different colors and sizes of weft. 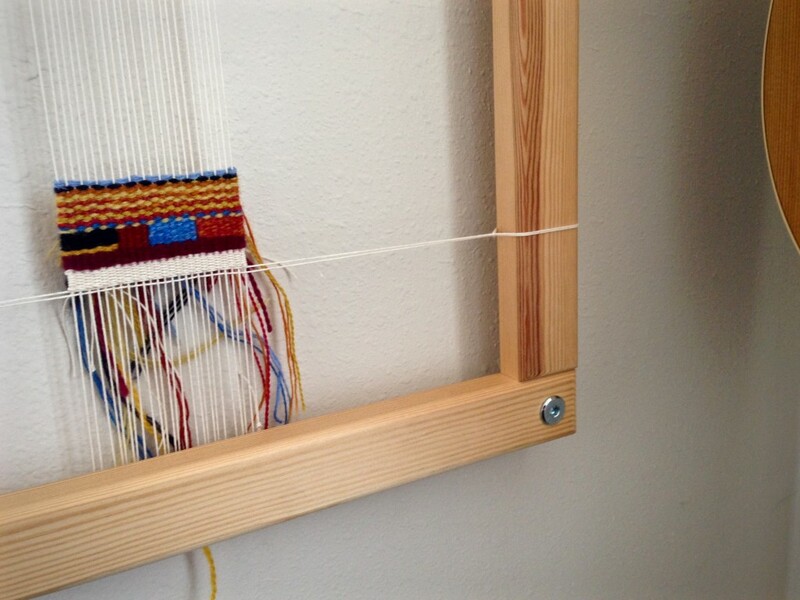 The weave is so airy; honestly, I was not sure if the fabric would hold its shape off the loom. To wet finish, I first soaked the sample for 20 minutes in hot water with mild soap. Then, I washed it by hand, lifting and lowering the net-like cloth repeatedly in the water. I rolled it in a towel and gently squeezed to remove moisture. Lastly, I laid it out flat to dry. Half bow-tie makes sure the linen will not slip. Adjustments are easy, if necessary, after weaving a few inches. Treadle tie-up happens in the “playhouse” under the warp in the back. Sunlight through the linen reveals “invisible” hairy fibers. Sample, not yet wet finished. Black and white view shows cloth structure. Result? It came through beautifully, with the lace weave intact. Linen, there is something about you that is exquisite and delightful, yet a bit mischievous and sly. I like you. After wet finishing and drying, the linen sample shows a glimpse of scarves to come. May all your concerns be as light as air. Your linen is beautiful. What weight is the linen? Now that it is summer it has great appeal. I agree, the airy linen practically feels like summer. I am using Bockens 16/1 line linen. Bockens has glorious colors in their line linen. Wow, I just picked up some estate sale linen – I don’t think I’ll make mine *quite* that airy, but yours is lovely! I’m thinking summer scarves, too. Lucky you for finding some estate sale linen! That is beautiful <3 As Diane I just found me some sale (16/2) linen and thought of such an airy weave right away. I just love these as an art piece. Klaasje, It makes me happy to think that you might try an airy weave like this! I hope you have as much fun with it as I have had with these scarves. 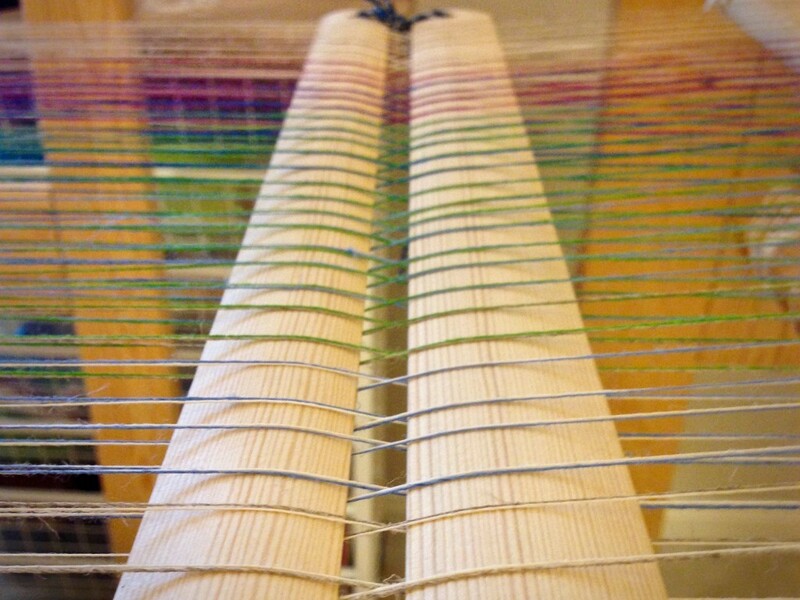 Linen on the warp beam. 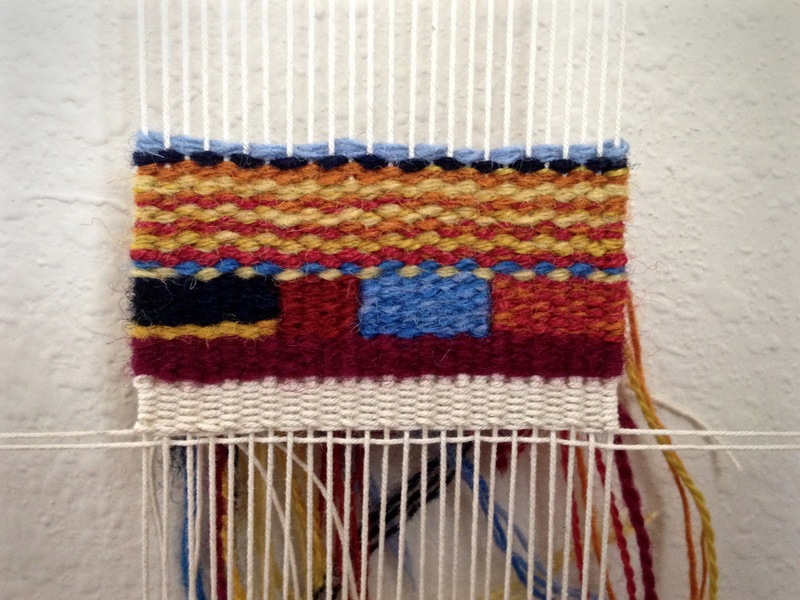 The colors blend from one end to the other, framed by bands of unbleached and golden bleached threads on each side. Lease sticks, tied to the back beam, maintain the order of the threads. 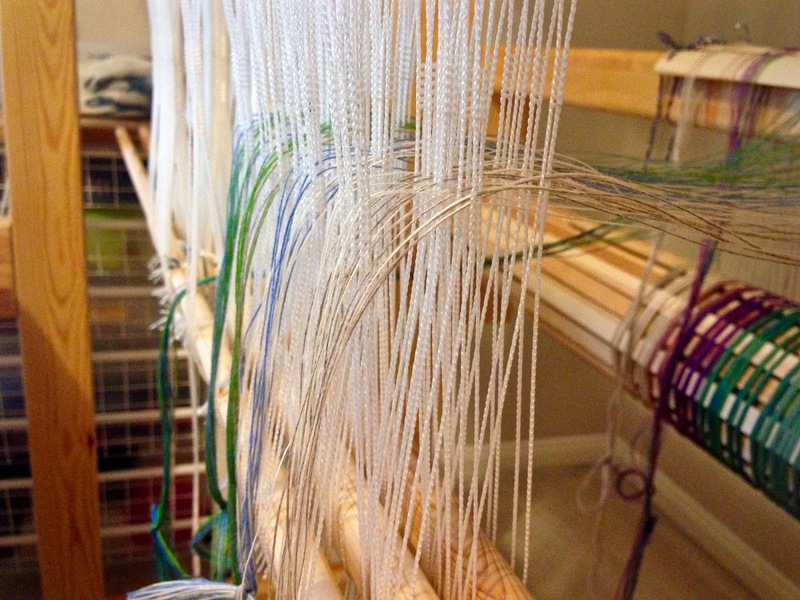 It makes sense to think things through before committing a linen warp to the loom. 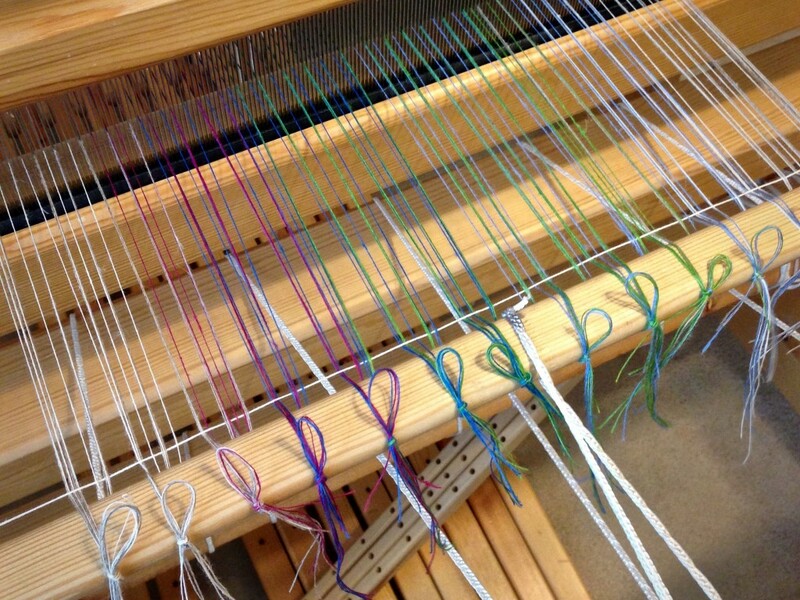 My excitement builds as the loom is dressed. 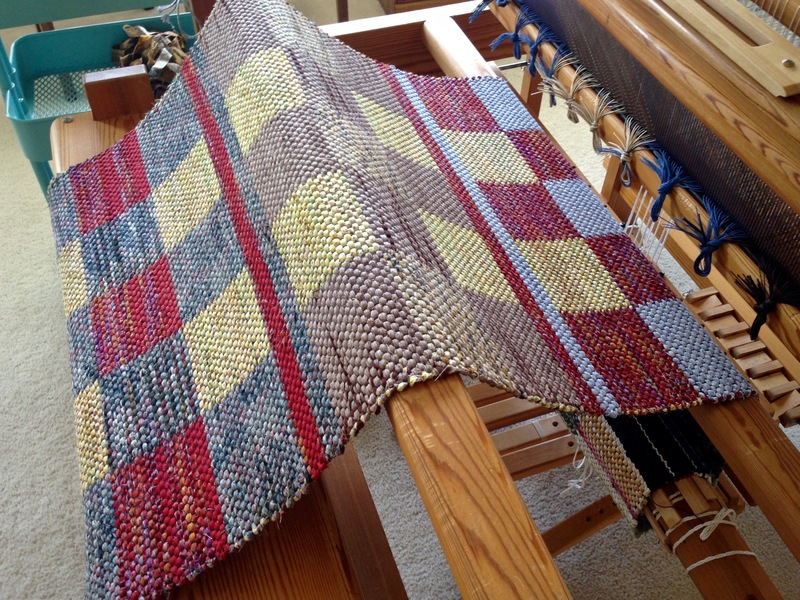 We will soon see the woven results when I experiment with weft options. I am secretly hoping for iridescence. 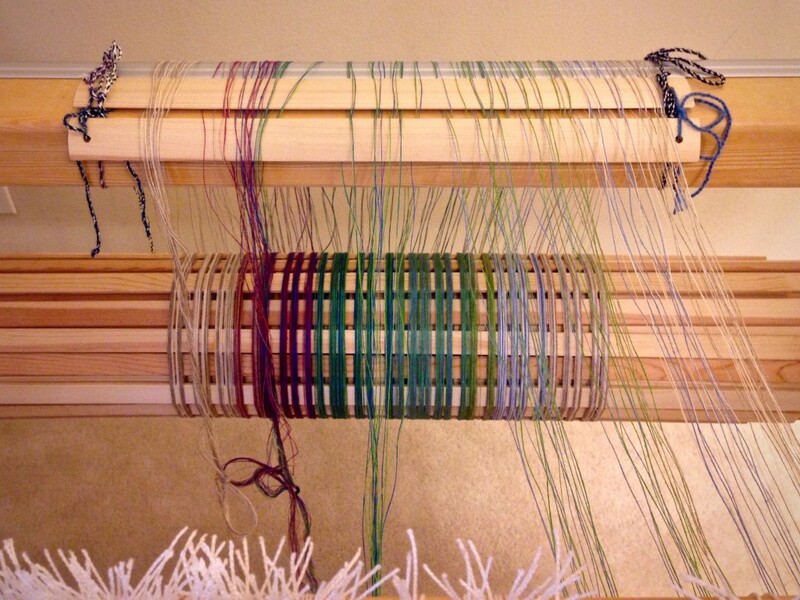 I can imagine it, but I won’t see it until the weaving happens, and the light catches the airy interlaced threads. 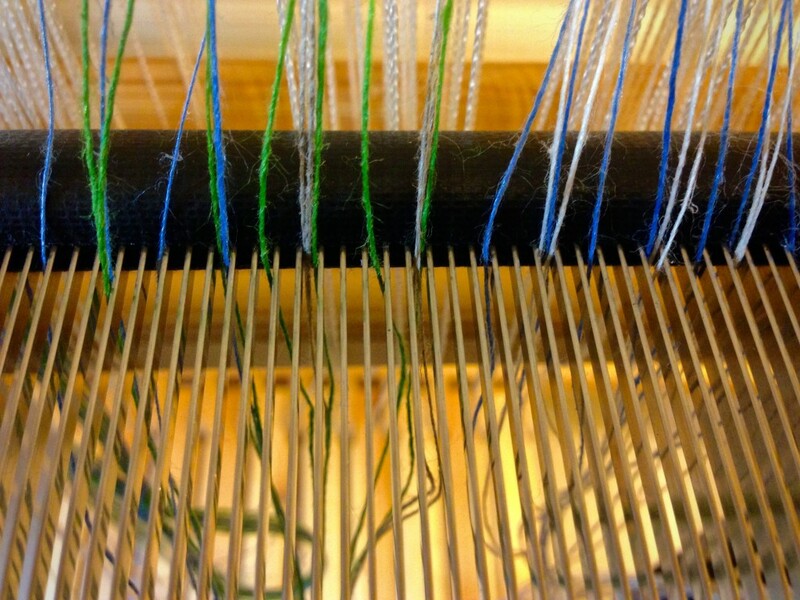 Each thread is inserted through the eye of a heddle. Color choices are inconsequential compared to other choices we make, but commitment is something many decisions have in common. We are invited into a personal walk with Jesus Christ. It is no small thing to consider an agreement with the Master. Like dressing a loom, it is a commitment. The excitement comes when you realize that iridescence and other mysteries may come true before your very eyes. May you have a life filled with the glow of iridescence. I am getting a late start on this month’s tapestry diary, so I am selecting a smaller palette of colors and a narrower warp. This is doodling with yarn, using a few simple shapes and a handful of colors. Tapestry frame hangs where we see it daily. Art in progress. Here I go blending colors and making color gradations again–in miniature. Three strands of red, and then one of the reds is replaced with orange; next, another red is replaced, making it two oranges and one red; and finally, the last red says goodbye and now the three strands are all orange. And why not insert two rows of yellow blends between each two rows of the red-to-orange gradation? The whole thing is a wordless color story. It requires several colors to do this, each one having its part to play. Some colors work better together than others, but every color has a place. Each color strand is essential to the story. 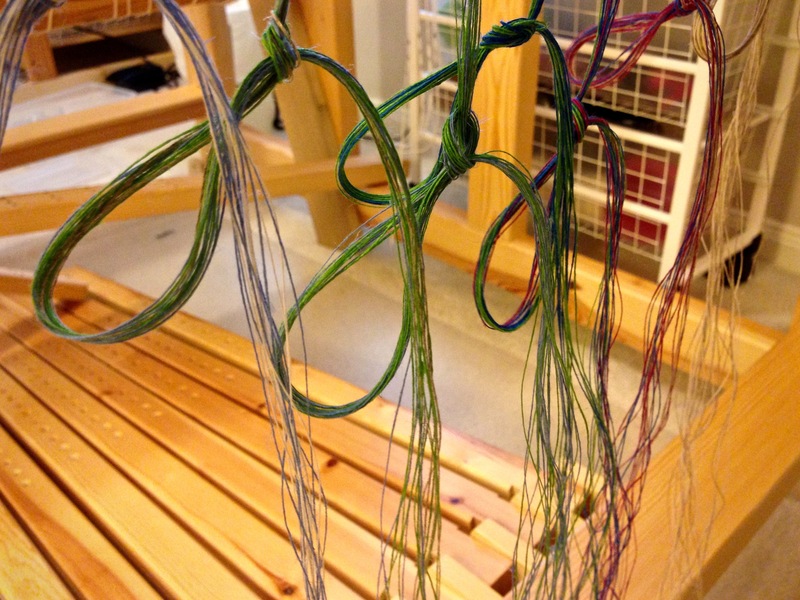 Two picks of a weft color (or blend) create a wavy line. A single pick of a color creates a dotted line. You and I are not here to please and satisfy ourselves. We are here to tell a bigger story. We worship God by using our individual gifts to serve and to function in harmony with others. 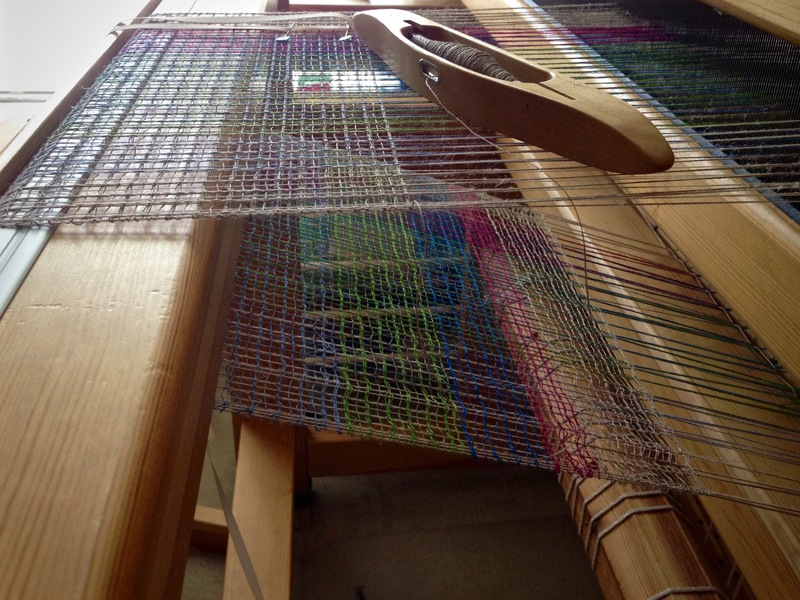 The resulting woven tapestry, when finished, will reveal the skill of our Grand Weaver. May you blend well in your relationships, using your gifts. Where did you get your tapestry loom? Did you make it? This is the Freja Tapestry Frame (15 1/4″ x 17 3/4″) by Glimakra. It’s a great little tapestry frame! I got mine from GlimakraUSA.com. I do have a smaller one, very similar to this one, that my husband made for me, that’s about the size of an iPad. Despite the fact that I have been looking at the thing all the while I am weaving it, no matter how well I have planned, or how many hours spent warping and weaving, there is always an element of surprise when the woven thing is cut from the loom! When first rolled off, you only see the back side… But what about the front? How will the rug look on the floor? Did the colors work out? 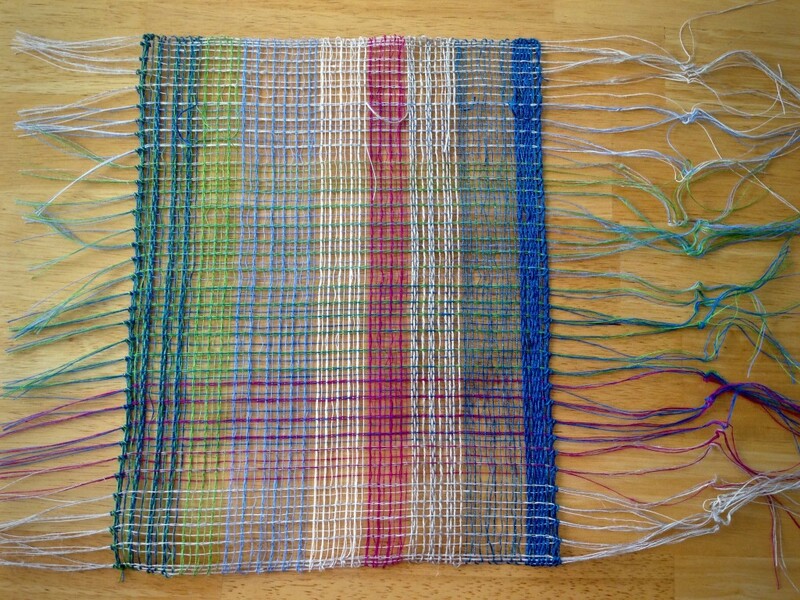 Are there any weaving mistakes that show? 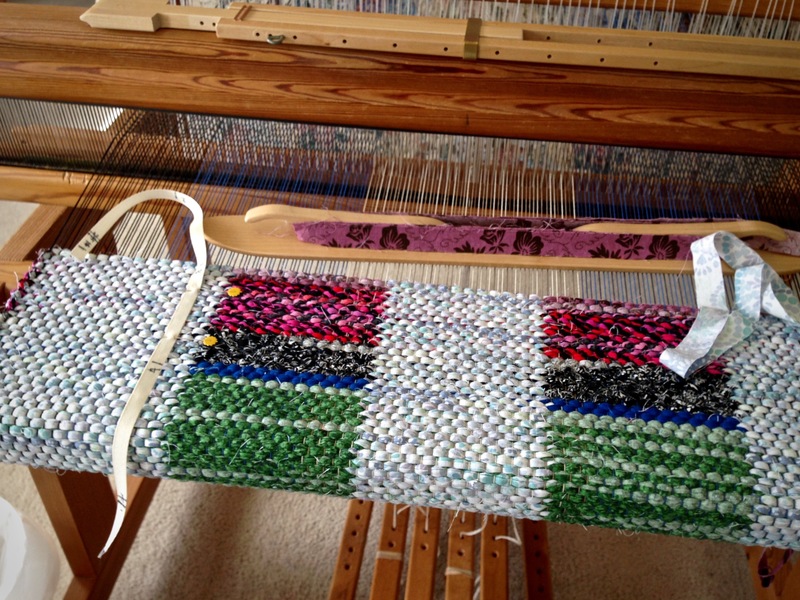 Rag rug is unrolled from the cloth beam, giving the first complete view of the underside of the weaving. Willpower, good intentions, and positive thinking can only go so far in giving me a realistic view of what I can accomplish, and how to face failures. I need grace. God’s grace enables me to have a truthful view of reality, and the requisite humility and courage to express it. May all your surprises be better than you expect. 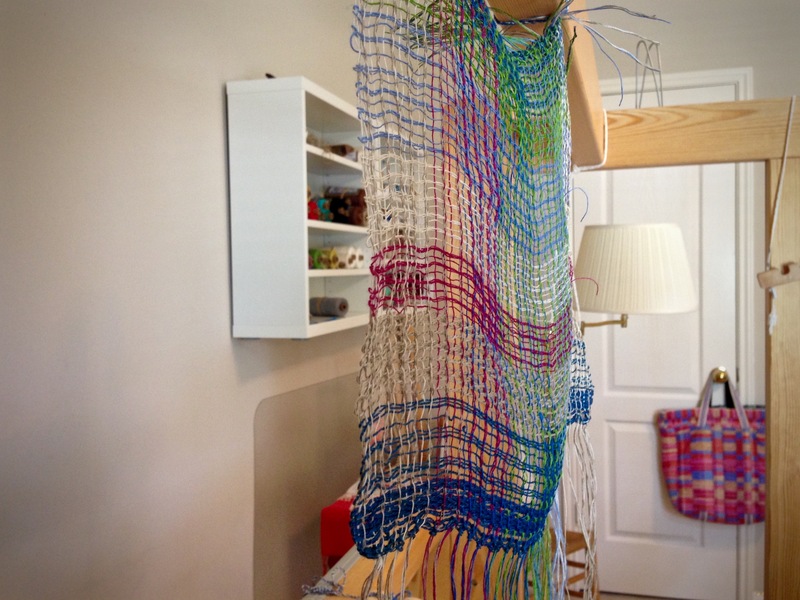 I so admire your weaving and the philosophy that goes hand in hand with your art. Being new I keep hoping I won’t make any mistakes if I’m careful, but I’ve rethought this and acknowledge mistakes are part of learning the skills and acquiring virtues such as patience and grace. Soon I will be ready to put this into practice! Trish, you have really touched me with your thoughtful sentiments. I love what you are saying about seeing mistakes as being part of the learning process! Consider those little oop as your signature. Perfection is so overrated! My signature is usually a few gray hairs woven into my projects.